Hollybeary Creations : NND Jan Release Day 2! NND Jan Release Day 2! It's day 2 of the January Release from Newton's Nook Designs and today we are sharing my Favorite stamp from this release... Caffeinated Cats. These guys are so much fun to color and I have a million ideas for them. For my project today did some spotlighting with a Frame from the Framework Die Set. I stamped the image onto some Copic friendly paper and then I colored parts of the image in with Copics. Then I used the die cut frame from some Black cardstock to "Spotlight" the colored portion of the image. I die cut a sentiment banner from the Framed and Flags die set and adhered it along the bottom edge. Comment on the NND blog and Design Team blogs (see list below)! The winner will be chosen at random from the collective reveal posts. Make sure to check out each of their blogs and comment for your chance to win. You will not know which blog has been chosen so the more you comment on the better your chances are of winning! You have until Thursday, January 17th at 9pm EST to comment -- winners will be announced on the blog post on Friday, January 18th. What a great spotlight piece of creation. I love how there is shine on each cup, the color-combo, AND how there is a bit of color spill-over past the frame. Beautiful layout!!! Love your choice of colors!!! I’m loving your fun design! Such a fun new set! What a pretty and GREAT Idea! LOVE! Love how you used the stamp by highlighting the images in the frame! Beautifully colored, Holly! gorgrous card and stamp set is super great and fun! Adorable set and love how you used it! What a unique card design! I love how some are uncolored in the background and some are colored! Love how you spotlighted the colored portion! Beautiful card! I love the spotlighting. Amazing new stamp, love so much this fun and cute scene!!! Great design with the "spotlight" in the black frame, the colours are so vibrant! Fingers crossed, I would love win this stamp set!! :) Thanks for the hop! This is super cute! I love the colored image spotlighted in the frame! Love the spotlight colouring...the frame is a great idea. thats such a fun idea with the small frame and leaving some uncolored borders!! love this stamp set! Great card. I love how you framed the image. What a lot of coloring this took, and it looks terrific. I like the juxtaposition of colored and black and white. Inspiring! Oh yes, I want to win this cute stamp - love, love, love this! The caffeine & the kitties are addicting. Awesome card, Holly. So cute! I love all of these cup kitties! So cute and colorful. I like the framing. I like the spotlight approach! (lazy me thinks: less to color. ha!) These sweeties would certainly perk up my day! Very unique & creative card! Love the way you highlighted part of the stamp with color & a frame & left the rest black and white! Darling card! I love the way you colored the partial image and then framed it! 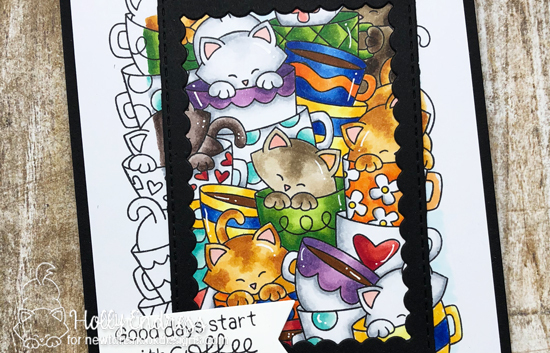 Love how you framed the colorful kitties! Nicely done! 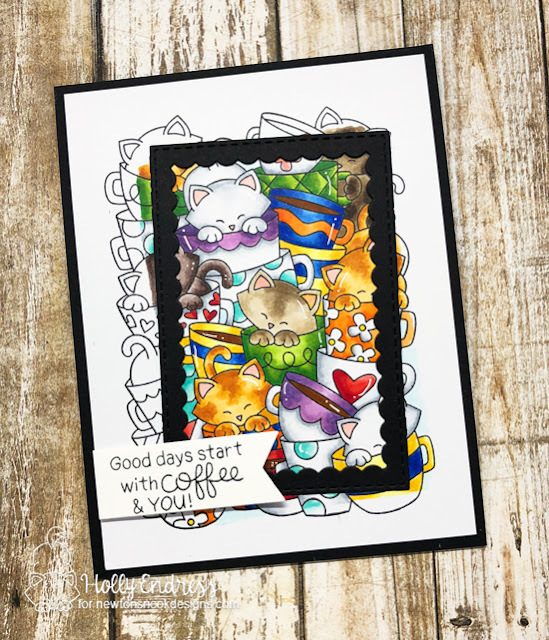 Love your adorable card and beautiful cats!!!! Loving this new stamp.....I really like how you used the die cut frame to spotlight the image. I love the pile of kitties!! Your coloring is awesome!! Love it!! I love the partial coloring with the black and while stamping underneath. It makes that image pops off the card. Your coloring is awesome too!! 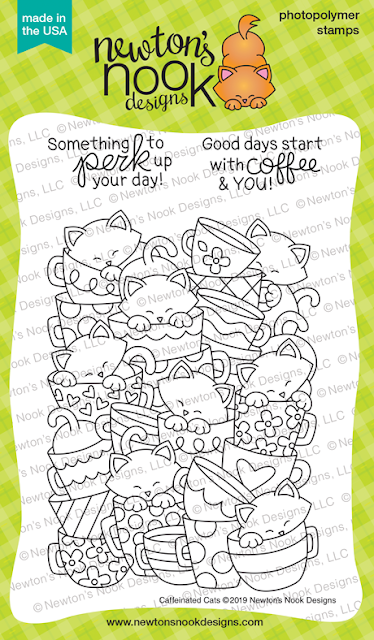 So lovin’ these kittens in the cups, your card is so fabulous with the spotlighting!! Really fun card - Love the framing! Wow.....your card is so beautiful and inspiring. What a fun way to highlight a portion of a background like this. Way too cute! Wow! What a killer clever idea using a smaller version on top! The black makes it pop! Happy New year! Love this stamp and you've coloured it beautifully.